In a recent issue of JAAS we highlighted work from around the world in the field of archaeometry. Also known as archaeological science, it is the use of scientific techniques to analyze archaeological materials, such as bone, ceramics, glass, and bronze. The themed issue was guest edited by Patrick Degryse, from the University of Leuven (KU Leuven), Leuven, Belgium and the issue contained some exciting papers on topics including Roman glass, human teeth, medieval village populations, and metallurgy in China. Click through here to take a look at the issue or read about it in the blog. The below papers will be free to access for 2 weeks. Here in JAAS we have published many papers on the topic of archaeometry in the past. Take a look at a few selected papers listed below. 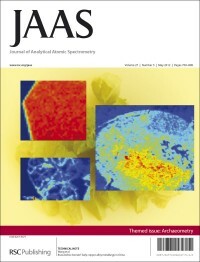 If you have a paper you are looking to publish in this field, why not try submitting to JAAS.